Hyper-IgE syndrome (HIES) is a rare primary immunodeficiency condition, occurring in one in million individuals. Most cases of HIES are due to sporadic mutations or show an autosomal dominant inheritance pattern. There is also an autosomal recessive form that is associated with distinctive clinical features. While the underlying cause of HIES remains unknown, the gene has been mapped to the proximal arm of chromosome 4q. Patients have defective T-cell cytokine response resulting in excessive IgE synthesis. An 8-year-old girl from Manipur with no consanguinity in the family and uneventful pregnancy presented with recurrent papulovesicular lesions on the neck, axillae, cubital, and popliteal fossae since childhood. The lesions healed with scarring. There was a history of recurrent diarrhea. Her younger brother also had similar lesions who died at 4 years of age for an unknown reason. Cutaneous examination revealed flexural dermatitis consisting of crusted vesiculobullous lesions on the ear, neck, axillae, groins, and genitalia. The ears were deformed and there was atrophic scarring on the eyelids and face [Figure 1]. 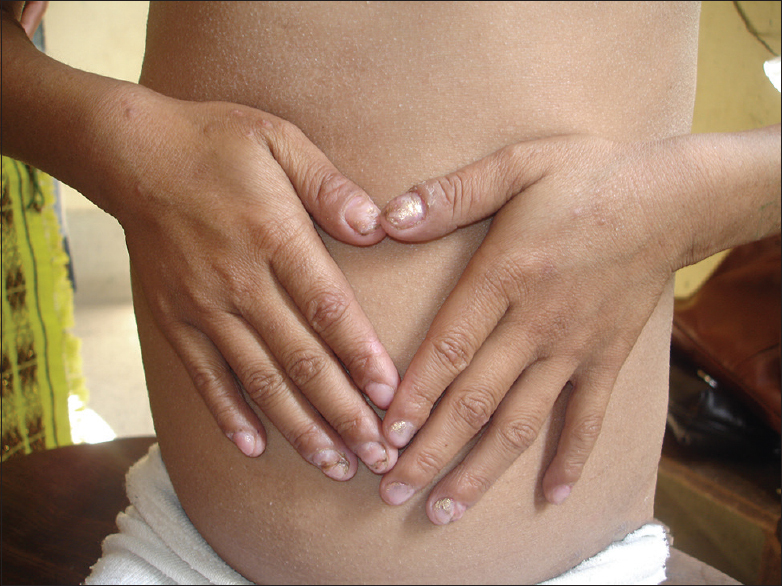 Fingernails showed dystrophy. (change dystrophied nails to 'dystrophic nails' in the legend of [Figure 2]). Scalp, palms, soles, and mucosae were spared. Skin biopsy showed orthokeratotic epidermis, mild dermal fibrosis, and moderate pericapillary lymphocytic infiltration. Anthropometric measurement was as follows – height 10.4 cm (expected 12 cm), weight was15 kg (expected 25 kg), head circumference 48 cm, chest 58 cm, upper segment: lower segment - 54:50 and normal dentition according to age. Premature loss of upper deciduous teeth because of dental caries was present. Systemic examination revealed no cardiopulmonary abnormality, but hepatomegaly of 4 cm below right costal margin was noted. ENT consultation reported bilateral acute otitis externa. Potassium hydroxide examination of nails revealed budding yeast cells and culture showed mixed growth of Trichophyton and Candida species after 3 weeks of inoculation. In routine blood investigations, total leukocyte count was 20,230/cumm with absolute eosinophil count-2080/cumm and platelet count 7.17 lakh/cumm. Serum IgE showed value >2000 KIU/L. Stool examination for ova and cyst was negative. Mantoux test was negative, and X-ray chest and lumbar spine were normal. Pus culture was sterile. Sputum for paragonimiasis also was negative. The patient was given oral antibiotics, topical antibiotic, and steroid combination cream. The patient showed improvement with this treatment but reported relapse of eczema on the neck and popliteal fossae after 2 months. She was treated with oral antibiotics, oral steroid, and topical tacrolimus. The patient failed to follow-up. To the best of our knowledge, this is the first case of HIES reported from North-East India. HIES is a primary phagocytic disorder that affects dentition, skeleton, connective tissue, and immune system. It is characterized by a triad of recurrent skin and lung infections, chronic dermatitis and elevated serum Ig E level. Although most cases are sporadic, two distinct forms are being identified. Relatively, common autosomal dominant variety is caused by mutations in signal transducer and activator of transcription 3 which is critical in the signaling pathways for interleukin (IL)-6 and IL-10 which mediate acute phase reactions and anti-inflammatory actions, respectively. In the recessive form of HIES, homozygous mutations in the gene encoding tyrosine kinase 2 were identified. Both the varieties also differ in clinical presentation, the dominant form is characterized by nonimmunologic features including skeletal, connective tissue, and pulmonary abnormalities in addition to recurrent infections and eczema while the recessive form lacks the somatic features and presents with severe recurrent viral infections, extreme eosinophilia, and devastating neurologic complications. Literature stress that neonatal dermatitis might be the first clinical manifestation in most cases of HIES. It shares several clinical and immunopathologic features with atopic dermatitis including reactivity to Staphylococcus aureus, abnormal cytokine responses and increased level of IgE. Accentuated scaling at hair line and retroauricular region with no increase in IgE productivity on IL-4 administration are distinguishing features. Allergic rhinitis, asthma, or other cutaneous signs of atopy may be absent in HIES. Recurrent staphylococcal superinfection is a common finding which may present as cellulitis, furunculosis, paronychia, suppurative adenitis, and deep soft tissue “cold” abscesses. Abscesses are “cold” because of suppression of IL-6 and IL-10 as well as defective chemotaxis. Recurrent severe sinopulmonary infections are also common caused by Staphylococcus or Haemophilus influenzae and may result in empyema, bronchiectasis, and pneumatocele formation. The face of the individuals affected by HIES shows characteristic distinct features such as coarse face, rough skin, deep-set eyes, a prominent forehead, prognathism, thick lower lip and auricles, a wide nose, increased interalar distance, palatal elevation, craniosynostosis, and macrocephaly. Serum IgE level can be elevated at the time of birth itself. A value of 2000 U/ml is considered as the cutoff point to establish a definitive diagnosis, though it can be normal (0.1–90 IU/ml) in 20% of patients and do not correlate with disease severity. There is no definite treatment for HIES. Every episode of infection should be treated with full course of antibiotics such as penicillins and cephelosporins which should be modified according to culture and sensitivity report. Many advocates long-term prophylactic antibiotic therapy against S. aureus. Intravenous immunoglobulins, methotrexate, ascorbic acid, levamisole, and azathioprine are some other drugs which along with dietary restriction can control dermatitis. Role of prophylactic antifungals is not yet proven. Although rare, primary immunodeficiency disorders like HIES usually present in early childhood. Dermatological manifestations may mimic atopic dermatitis and can be misleading. However, children with HIES are in danger as pulmonary infections can be fatal at any point of their life. Hence, early diagnosis and proper management are necessary. Thorough clinical as well as laboratorial evaluation should be conducted in any child presenting with recurrent skin and lung infections. Muhammed K. Hyper IgE syndrome: Report of two cases with moderate elevation of IgE. Indian J Dermatol Venereol Leprol 2005;71:112-4. Buckley RH, Wray BB, Belmaker EZ. Extreme hyperimmunoglobulinemia E and undue susceptibility to infection. Pediatrics 1972;49:59-70. Holland SM, DeLeo FR, Elloumi HZ, Hsu AP, Uzel G, Brodsky N, et al. STAT3 mutations in the hyper-IgE syndrome. N Engl J Med 2007;357:1608-19. Brandaoa M, Marinhoa A, Vitaa P, Barbedoa I, Farinhaa F, Vasconcelosa J, et al. Hyper-IgE syndrome: Report of three cases and review of literature. J Med Cases 2011;2:151-5. Schaffer JV, Paller AS. Primary immunodeficiencies. In: Bolognia JL, Jorizzo JL, Schaffer JV, editors. Textbook of Dermatology. 2nd ed. China: Elsevier Saunders; 2008. p. 801-24. Angurana SK, Angurana RS. Hyper-IgE syndrome. JK Sci 2011;13:111-4. Estrada-Reyes E, Hernnández-Román MP, Gamboa-Marrufo JD, Valencia-Herrera A, Nava-Ocampo AA. Hypereosinophilia, hyper-IgE syndrome, and atopic dermatitis in a toddler with food hypersensitivity. J Investig Allergol Clin Immunol 2008;18:131-5.